We were asked to videotape our testimony for Village Church of Midlothian last year. With all of the time that has gone by since Tonia’s death, it really helped me to remember again just how faithful God has been. There is never a day that goes by that I don’t think of Tonia. But every day brings me closer to seeing her again. In the meantime I laugh, I love, I sing and I worship! So much has happened in the last two months. I released my journal on June 30 and the response has been overwhelming. I have received so many comments and email questions from people who want to know more. More about how GOd has worked. More about how they can respond to a death. More about how to survive their loss. I am so devastated to see how many hurting families are looking for answers. but we can hold the umbrella”. I am so excited to be able to share and also to be around other mothers who are struggling, healing and surviving the death of their child. The deaths are from many different causes but we all have in common that we are mothers, we are missing our child and we know we want to reach out to someone else. If you have any questions let me know. There are carpools of ladies coming in from all over the East Coast and even the Midwest. Please keep me in your prayers as I prepare to share God’s message! Many hugs! 2012: Wow! I am amazed at life. It goes by so slowly at times and then it zooms by in a heart beat! I never know when this phenomenon will occur. This year has zoomed by. So much has happened. We bought property in Virginia, for the future! We put our home on the market and it sold in 5 days! We packed up all of our stuff and moved to a Virginia apartment. We found a builder and started building a home. We shopped around for a new church and found a great fellowship. Sean flies to California and returns an engaged man! Incredible how life’s blessings happen all around us! When we moved to Virginia, I had one request. I wanted to travel back to Pittsburgh at least one time each year, specifically at the end of August, to visit Tonia’s grave. Her birthday is August 29th. This visit is my way of honoring her life and remembering her. In between visits, I am planning on putting in a beautiful memorial rock garden in a sheltered corner of our new property. It will have a bench and a carved rock and all of the rocks I have been gathering up as our home is being built. Every “new” rock I find is my way of capturing a prayer and a memory. They are physical reminders of the gifts that God has given us in the past and into the future. They are memories wrapped up in a physical home. I can’t wait to place them in the garden but I have to find the perfect place first. Last weekend was our first visit back to Pittsburgh to specifically go to the cemetery. It was such a bittersweet day. In May I had planted various new plants hoping they would live and thrive. Since we hadn’t been back there since they were planted I had no idea if they were alive or not. We took a new bag of mulch, our gardening tools and 3 gallons of water with us. When we arrived I was absolutely overjoyed to see that several of the plants had survived! Rick and I began cleaning up the area when the sweetest thing happened! Back tracking a moment: Tonia loves, loves, loves animals. She would even save spiders from being killed! She was such a softy for every stray animal and every wild animal she could find. So back to our visit to the cemetery. Rick was cleaning up a pile of dead grass behind the headstone. As he lifted it up I saw him jump back in surprise. I thought it was a bunch of bees but then we began to see baby bunnies hopping away in all directions! The pile of dead grass was actually a nest. I caught one of the bunnies in my gloved hands and returned it to the nest but it very quickly hopped away. One bunny remained huddled into the hole right by the headstone. We quickly finished cleaning up and putting the new mulch down. The baby bunny stayed there the entire time! 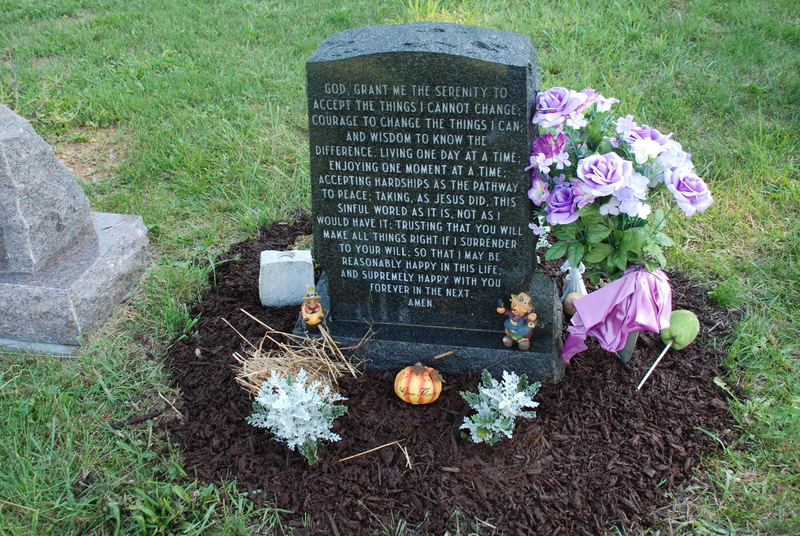 The bunny nest at the back corner of Tonia’s headstone! Baby Bunnies; I never imagined what joy I would receive from seeing bunnies at a cemetery. For me it was just a confirmation of God’s love for me. He showed me sweet new animal life just where Tonia would have wanted them to be, Right by her! Rick and I both commented that we could hear her sitting quietly calling the bunnies to come to her. It was a precious moment. Happy Birthday my sweet girl! I love you so very, very much! Over the last 4 years I have written so much about our journey after Tonia’s death. It has been so cathartic for me. I have been able to write and to hear from others. This journey will never be over. It has changed my life. It has changed my relationships with Rick and Sean. God found me in the deepest valley I can ever image going through and he provided the strength to rise up and continue to live the life he designed for me. It is time to shift focus. Titus 2:4 says “so train the young women to love their husbands and children”. This passage resonates with me. My passions are people, people and more people! I want to talk about life. I want to share Jesus Christ with the world. I am passionate about helping others wherever they are at the present moment. In saying that I have decided to start a new blog. I am calling it “My Journey of Faith”. You can find it here: www.kathybrundage.wordpress.com. I will be writing about marriages, about our relationships to each other and even about our trip to Israel next year. 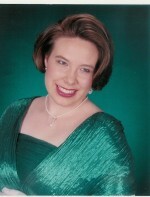 I will continue to update this blog when there is something relevant to post about our journey after Tonia’s death. I am currently writing a book and if God want me to publish it in some form then I will post that info here. It maybe that I create it as an e-book that can be downloaded but I am waiting on God’s direction. I am also open to the possibility of speaking so I am having a new speaking sheet made. God’s hand is at work! The lesson I have learned over the past 4 years is that life hasn’t stopped. It has changed. But God has a purpose and a plan for the rest of my life here on this earth. Hope you can stop by and visit my new blog site. I am excited about the possibilities! With much love and lots of HUGS! Four Years….. Is it possible? July 1: once upon a time it was just another day. A day spent looking forward to the 4th of July fireworks, food and friends. It was just one more day on a calendar of our busy lives. But like everyone else in this world with days that have a significance only to them, it has taken on a new meaning. Our country has significant days: July 4, Memorial Day, Labor Day, The bombing of Pearl Harbor, D-Day and September 11. What once were just days on a calendar have taken on new meaning because of the events that happened on the day. Days when lives were touched, changed and the world as we knew it became different. July 1 is that kind of day to us. But we have a split view of the day. On one side of my mind I grieve over the day. It is the day that Tonia left this earth forever. It is a day that our daughter was taken from us in a mindless act of violence. My arms are empty and my life is emptier without her smile and her voice raised in song. I miss my daughter. I miss the woman that she was becoming. I miss the future possibilities. But then the other side of the coin is revealed. July 1 is the day that God welcomed His child into eternity with Him. The choirs were celebrating! Heaven welcomed her home. She saw God face to face. I can only imagine…. One moment she was in this world then the next she was dancing in the Holy presence of God. My heart rejoices. My heart yearns for home. July 1: tears of longing, regret and loss coupled with smiles of eternal hope and promise. Never again will July 1 be just another day on the calendar. But something else happened on that day. I lost my fear of death. I gained an assurance that no matter what happens God is with me holding on to me. I was reminded that everyday is a gift and an opportunity to praise and worship and share the love I have from my Heavenly Father. So although I still cry, I also celebrate. I remember. I give thanks. So today, July 2 I am smiling because I have a gracious, merciful God who carries me and waits to throw a welcome home party for me! On May 17 we were married for 25 years. A milestone in so many ways. When we were married neither one of us knew the Lord as Savior. We grew up in different worlds. Even our attempts at discipline were vastly different. But even before we accepted our Lord as Savior He was already blessing us. Rick and I both wanted a strong relationship. I wanted someone I could trust and count on. Rick wanted someone to verbally and physically show him affection. I married a man who is my steady rock. His word is truth. I can lean on him and he will catch me when I fall. Rick married a hugger! I hug strangers after a few minutes of knowing them because now they have become friends. I gift Rick with words of appreciation and respect. We both thrive! Now that doesn’t mean we haven’t struggled. We have shaken the rafters clean over and over. We have shouted and cried and I have walked out of the room and even out of the house once! We have fought over our kids, money, family, jobs and even God. God used Rick to penetrate my heart. Rick was given the gift of knowing that he was looking for God. God knocked on his heart and he responded. Then God used Rick’s love for me to knock on my heart. 11 years after we were married we both accepted Christ as our Savior! Our life, our marriage and our kids were changed forever. Then we lost our daughter, Tonia. The loss of a child usually ends up with the divorce of the parents. The statistics are over 60% of couples divorce after the loss of a child. I believe it. This loss shakes the foundation of your relationship. Communication hurts. Not talking hurts more. The world invades! But we made it. We survived! We continue to grow closer to God and closer to each other. We learn daily what it means to think of each other before ourselves. So, on May 20 in front of family and friends, we united in marriage with God as our center. We wanted to renew our vows for so many reasons. We renewed our vows as a declaration of how important God is in our marriage, as a declaration that our marriage is thriving and as a re-commitment to each other for the rest of our lives! Our celebration was so much more than I ever expected. Friends came to be with us once again but this time in joy. Celebrating with us and promising to stand by us yet again. The music spoke to my soul. It nourished the part of me that hears music in every moment of the day. Our son honored us with his words, with his presence and with his love. His tribute to our marriage was his promise to his future wife. Pastor Jeff delivered his message to us and to every couple who was listening. His challenge to us and to every couple married or planning on marrying was; If God is at the center of your life and your marriage then your marriage will grow stronger. The evening was wonderful! God was present. God was honored. Rick and I declared to the world our promise to stand together no matter what. Family and friends shared in the celebration. It was more than I ever dreamed it could be! Thank you Father for once again blessing us. We did… all over again! This is a post our dear friend Matt wrote about our 25th Anniversary celebration. I am humbled by his kind words. He is such a blessing in our lives. He and his wife, Jolynn, have shared an inner city dormitory with us, shared laughter and tears, and he honored us by conducting Tonia’s funeral service. Matt and JoLynn have two wonderful kids who we have enjoyed getting to know. You did. But would you again? That’s the question now isn’t it? Twenty-five years married is a milestone. Some couples, struggling through, can’t imagine making it 25 more days let alone 25 years, and sadly, marriage as an institution has become filled with so many caveats and qualifiers, that for practically any reason they choose, they don’t have to. Well several Friday nights ago, in spite of and in contrast to this modern marriage malaise, there was an hour of clarity, celebration, and commitment. My friends, Rick and Kathy, in front of family and friends, and before God, renewed their wedding vows after 25 years of marriage. Christian marriage was held up as the honed and hammered treasure, the sterling and sparkling gem that it is. It’s every brilliant and glorious facet on display. 1. Jesus was made much of. I came away with the distinct impression that had Jesus not invaded the lives of Rick and Kathy, their marriage would be as the debris on a shoreline, sadly like so many marriages. Instead, Jesus transformed each of them individually and both of them together. Jesus did this. And He got the credit. Who is the couple doing marriage in yourself and for yourself? Press into Christ. In marriage as in all things. He must be preeminent. 2. A son heaped praise upon his parents. Marriage usually produces children, and Rick and Kathy’s is no different. 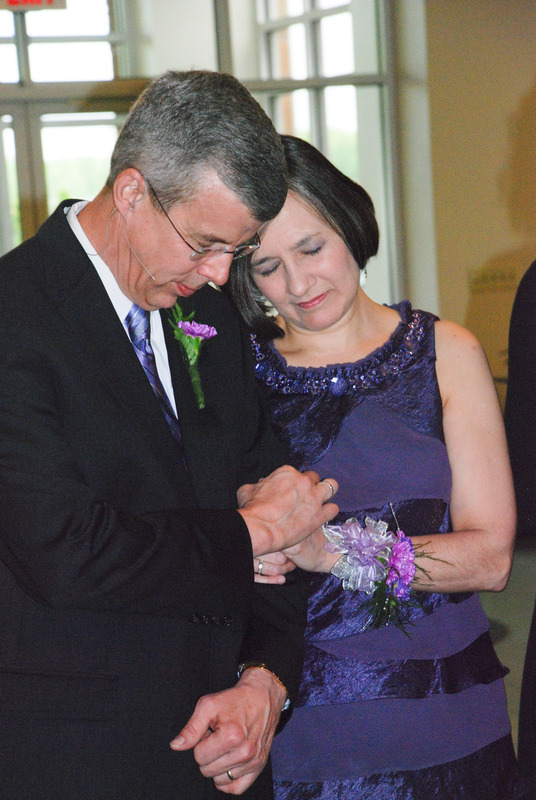 Their son Sean, blessed his father and blessed his mother with words of laughter and love. For most of us this only happens when we are dead. What an honor for Rick and Kathy to hear Sean speak these words over them when they are alive. Parents, what ways are your children walking in? How will your example become the fodder for the words they use to call you blessed some day? What a great thing to not wait until the grave for these words. To hear them and be humbled by them was tremendously honoring. 3. Everyone knew that twenty-five years of marriage has been happy and hard. We heard about the seasons of fighting, fear, and failure, times when either of them could have walked away. And I wonder…Are you, perhaps young in marriage, looking down the road, wondering what will come? Here’s truth: It will be a happy road, but it will be a hard road. And I saw two people who faced and embraced each season, learned to run to God, forgive each other, and arrived together with joy in Christ. 4. Passionate love was on display. I saw embrace, emotion, twinkles in eyes, a loooooong kiss, raw, romantic love. Rick and Kathy love each other. Who is the couple that will make it twenty five years gritting it out for convenience or necessity…for the kids or for financial reasons? Becoming merely roommates or strangers. Hear this. Keep love alive. Arrive in 25 years as Rick and Kathy have. In love. 5. Christian community is an obvious and integral part of marriage. Rick and Kathy were surrounded by the people like Jolynn and me who have lived life with them. Some there have known them for a much longer time than Jolynn and me, and some for a much shorter time. We were all there. We…The church was there. The ceremony could have been a church business meeting minus the arguing and voting. We, the church, are Rick and Kathy’s spiritual family. We’ve sung and studied the Bible together, been to picnics with each other, walked through the valley of the shadow of death holding on to each other, laughed hysterically together, reared our kids together, shared our prayer requests with each other…held them accountable and have been held accountable by them…Rick and Kathy live in the community of saints, so of course they would celebrate their marriage with the “family”. Couples, you need each other. But you need the church just as much. Thanks Rick and Kathy for a great display Christ’s faithful love for the church. In a few fast years Jolynn and I will reach this milestone. We cannot wait, and Rick and Kathy reminded every couple: we can do it. We can make it…thriving! With Jesus Christ at the center and love very much alive. I have been asked time and time again about our decisions about forgiveness and the choices we made. I wanted to share some thoughts I recently wrote in response to a very confused and angry letter I received. The writer of the letter was not mad at me but she was made at JC, my family and the circumstances surrounding Tonia’s death. Here is my response. These are my thoughts on why people acted the way they did. Grief, guilt and anger creates emotions that can cause reactions that don’t always look pretty. As far as my family, they are lost souls. I have forgiven them but forgiving doesn’t mean trusting them. I have chosen to avoid my family reunions because of the possibility of someone saying something stupid and me blowing up! I am only human and distance makes it much easier to handle my emotions. The thing I still struggle over is what to do with our story. I have been asked to share our story and if it could help one soul come to know Jesus as Savior I will do it. But I also do not want to further hurt anyone in my life. I don’t want my point of view and our story to drive a wedge between my family and God. My desire and prayer for all of them is to come to know Jesus as Savior and I do not want anything I say to hinder that. Saying that I also understand that it is not up to me. God has been putting people in their lives and they have heard our testimony. They have to choose. The easiest thing to actually do was to forgive JC. I do not say that flippantly but when you are thrown into a deep dark place the only way to survive is to hold onto the light. Surviving meant trusting God. Surviving meant choosing not to become angry and bitter. These two things meant that not only could we but we must forgive JC. And over time we learned to love him as the lost child of God that he is. He is in a cold, dark place in his soul and now physically in his life. The only way he will survive prison and then life after prison is to allow God in! He may be hardened to God and his judgement will be eternal separation. How horrible! I would not wish that on my worst enemy. How ugly that possibility sounds! Now we grew into these feelings over time but we chose to trust God from the beginning. It was the only way to survive the nightmare of real life during the day and the nightmares that happened as I slept! As far as my feelings toward my family, I hurt inside over what they did and did not do. I wanted and expected more but I have come to realize that they were not capable nor could they understand the situation. Their focus was on themselves. Their hurts. Their desire to be loved by Tonia because she gave them unconditional love. It is hard to be a parent, grandparent, aunt or even a friend and treat a situation with tough love. When you do you are not liked very much. Their insecurities would not allow them to do anything that would possibly make Tonia angry so they said yes to everything. She learned that true love means saying no at times for the long term benefit. Then the unthinkable happens and she is murdered! Imagine their horror. They don’t believe in God or heaven so they will NEVER see her again, love on her again! Their world with her is finished. Their anger at the person responsible overwhelms their mind and heart! They can’t take any responsibility about events in the past because the guilt would kill them! Literally kill them. Their anger is already killing them but in such a slow hard way that they don’t see it. So they blame JC. They have no control. No one is telling them anything so they feel helpless over the legal news. Now their anger is turned toward us. Give them their Tonia! Give them her body so they can control something. Let them shout and scream at the media because their rage needs to be heard. During this they hear from us at her funeral: “JC and family we will always be tied together over our love for Tonia. You will always be our family.” WOW this is a slap on their face and in their mind a slap on Tonia’s face. How dare you even allow those people to come into the church for her funeral and then tell everyone they are family! We are then part of the enemy, we must not have loved Tonia the way they loved Tonia. So the battle lines are drawn! They will defend her honor. Avenge her death! They have a new mission! But we are in their way. The media and prosecutor give us a voice. We are given the information and then we do the unthinkable, we accept a plea bargain and even tell the world we forgive him! A red flag in front of a bull has been waved! This is their lives. They have made choices. I cannot change their choices. All I can do is to respond. Anger, bitterness and regret or letting go, trusting God and praying for their souls. I can live with my choices. God has approved. Maybe one day I will even hear “well done”! But for now I have peace over my heart. Do I still long for more at times….. YES! But God is my family, my protector, provider, comforter and friend. I WIN! Have I ever blamed them for their SMALL part in what happened. YES, but Tonia made choices also. We made choices. So when I am tired and frustrated I try to blame someone. But all that happens is I get thrown in the dungeon. Satan gets a small foothold into my life. Anger and doubts creep in and the nightmares come back. So once again I have to ask God to forgive me for my lack of faith and trust. I ask Him to give me strength again to survive this nightmare. I need to forgive myself for the tough love choices we made, the times I got angry at Tonia and JC. Then I need to forgive once again the choices my family made. Forgiveness doesn’t happen once and it is finished. It has to happen over and over until it sticks for longer periods of time. I still have to remind myself of the little boy scared in prison crying out for his daddy to save him but not understanding which “daddy” he truly needs! So with that picture in mind, I forgive JC! My family is also in a prison of their own making, so I have to forgive them. I have made mistakes I regret. I can choose to live in the past or I can choose to live in the present with hope toward the future. I don’t know what the future holds but I am in God’s hands and NO MATTER WHAT He will sustain me. Thanks for listening. I pray that God is in your heart sand that He sustains you during the dark times! Who do you turn to …..
Over the last few months I have been reflecting on what I want to share as I get ready to take a leap of faith. I have been working on some speaking information as I get ready to mail out my speaking sheet to local churches. As I was reading a fiction book I was struck by a question asked by one of the characters. It fit with my thoughts. For me those answers have varied depending how much I have allowed God to be a part of my life. If I were as following God intimately the answer to all of my questions would be….God! But because I am so human then I turn to friends, my husband, my family. These people can be wonderful and they usually are but at times they have let me down. They are also struggling with their own issues. They love me and I love them but God loves me perfectly. He allows me to call him Abba (daddy)! He loves me with an infinite love, perfectly! Even when I mess up. He is my Father. I need to continue to mature in my faith and learn to rely on Him even more every day! My next thought is How do I choose to respond…. I will save that for another day!